Raffaello′s Lion X is one of the most important portraits of the Italian Renaissance and one of the most well known and precious works hosted in the Uffizi Gallery. Exposed in the Red Rooms of the Florentine Museum, the painting is now at the Opificio delle Pietre dure. In the important Florentine institute, Raffaello′s work will undergo a major restoration, which will probably end in 2020, when the fifth anniversary of the death of the artist from Urbino will be celebrated. Restoration will not only aim to improve the state of the work, but also to know more about its features and its story. For this reason, the scholars of the Opificio are subjecting the picture to a series of analyzes, with very sophisticated tools. Its conditions seem pretty good. Raffaello painted the Portrait of Lion X, Pope of the Medici family, on the occasion of the the marriage between Lorenzo Duke of Urbino and Madeleine de La Tour d′Auvergne - parents of Caterina de′ Medici - in 1518. 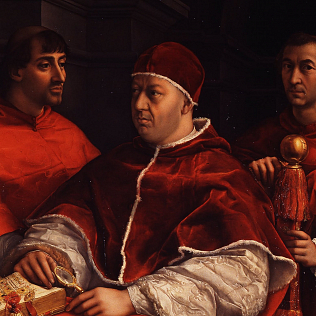 The pope could not attend the ceremony and sent his portrait in Florence. In the work, beside the pope, two cardinals of the Medici family are represented: Giulio - future Pope Clement VII - and Luigi de′ Rossi.